I wanted to do a personal update myself actually since the current texture pack surely could be improved, however, I was unsure of what style would really fit the blocky graphics. I felt that fancy graphics like yours would turn Minecraft to something I at least wouldn't like to see it, boxy with that sort of deatailed textures. I belive it's the basic ingredients that really makes this game, graphics included. Either use more diagonal and square shapes to fit the actual box shape. I play the game myself quite often and I really like what I see, in a fan art perspective. I hope you finish it too! Make it or break it Junkboy! This texture pack has some lovely pixel art and lovely tiles... but to me it's unfortunately all over the place in terms of style... some tiles are very subtle in their contrast variations, and some are extremely harsh, completely clashing with each other! You have to decide which way you want to go. Personally, I would prefer if you picked the subtle tiles, because the default tiles have a lot of contrast, and there is a very popular "classic RPG" set of tiles out there already which also has quite a lot of contrast, and is slightly similar to yours (and again, personally I like a very abstract set of tiles with only nine subtle colored squares for each tile, which makes the entire game look very smooth). Oh, and regardless which way you go, the water tiles look awesome as a texture, but in your screenshots from the game, it's just a grainy mess. You need to ease off on the detail there, or kill some of the highlights. Also, seventh from the left, four down... I have no idea what that is, so as an icon it fails (but also a symbol I do not recognize it). What exactly is clashing? Sometimes it's natural for some things to be contrasting while others to lack it. If something is soft then chances are there isn't going to be anything that creates contrast, like say... a somewhat smooth tree bark. On the other hand the face of a rock with rough jutting edges is going to create more contrast as it creates more depth. If you get more specific I can look into it. There is some technical reason for this, though I can possibly try to address it. There are actually two reasons for what you're seeing as far as "messes" go. First, Minecraft doesn't support any AA. That means the more distorted things get from perspective and distance, the more noise and mess you get. This will happen to any game without texture filtering. The only way to really fix this is to pretty much lower the contrast to a harmful level and wash everything out so nothing can clash when it gets distorted. Secondly, I'm using a custom animation to represent the water moving, but the texture is being stretched larger than the actual texture(roughly twice the size or more, depending on the resolution), so even though the texture is moving at the smoothest possible increments(a single pixel every frame) it looks like it's jumping around as it moves. The only way to fix this is to combine my animation with code to handle the scrolling for me... sadly out of my skill range. You probably can't recognize it because the game handles the most noticeable feature: a needle. It's a compass, so the engine is what renders the needle, since it needs to move around actively inside of the icon. Aye, I may go with a giant seed for an icon instead of individuals. I think that is the biggest problem I'm having with the tools is coming up with variations. 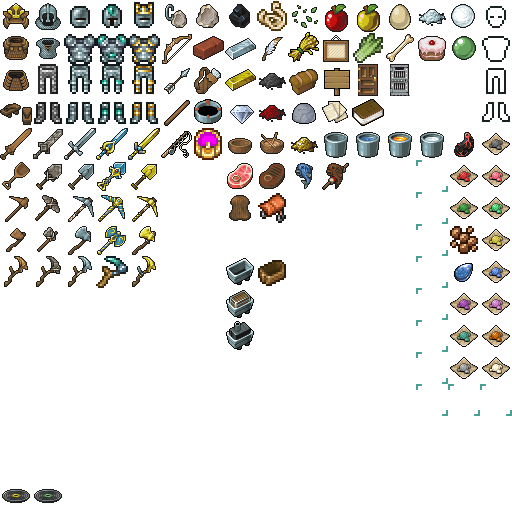 It's been brought up already about the stone tools looking too similar to the iron tools, and I plan to remedy that with using a darker palette for stone tools. I actually came up with a new design for a sword that resembles more of a caveman-esque carved sword instead of something you'd pull out of a blacksmith shop. Though in the end the other tools are the ones that are going to suffer. Swords are somewhat easy to come up with various designs, but a pickaxe? A shovel? These are where I kind of lose creativity, heh. 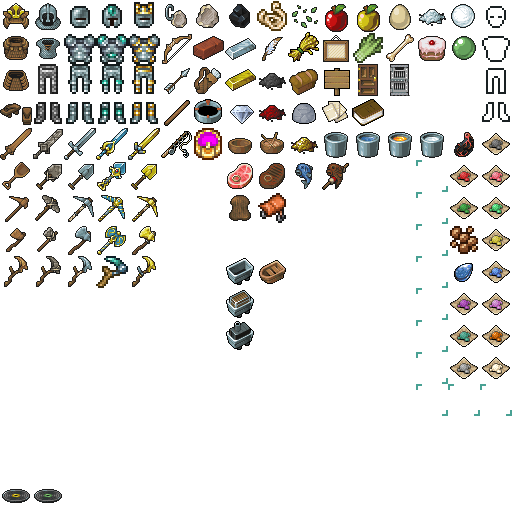 On a side note, I am currently working on some entries for the official texture contest which will sadly only accept 16x16 textures. So this texture pack may get some neglect unless I get bored with the others. I definitely am going to finish this though as it makes Minecraft feel much more lively for me. I may post my other WIP textures in here, one is cartoony and the other is sort of a mini-version of this. The cartoony one hopefully fits more towards the blocky feel of Minecraft that everyone has brought up as it's heavily inspired by the old Sonic and Mario games. Because honestly I'm not sure how to address that problem with this texture pack as it was never meant to be a abstract sort of texture pack. Hey, I've been working on this quite a bit since I last posted. But I'm currently very stumped on one particular icon: the boat. As you can see from the minecart next to it, they're meant to be at an isometric angle, but I can not for the life of me figure out how to get the angle of the tip of the boat in isometric. I've tried multiple times and each looks worse than the one before it. If anyone could help me figure this out I'd greatly appreciate it. I suppose the one in the center is the one I'm happiest with, but something still seems off about it. First off these are amazing, there beautiful reguardless of what they are being used for. Now the main problem(in my opinion) that you have is your color have alittle too much contrast. what looking at your tiles in game they are awesome but also feel very cluttered. try mellowing out the terrain tiles, mainly tiles like the ground tiles in the screen above by smoothing out the dark lines, and i think it will create a much more visually pleasing world. This is a technical limitation on the games part. The game lacks anti-aliasing so the farther out the texture is the more it's resized and skewed and thus the noisier the texture becomes. Games usually remedy this by AAing and blurring textures farther away from the camera. I don't think I want to compromise contrast to the degree it would take to address a problem that is the game's and not my own. I'm also not even sure I COULD fix this problem without lowering the contrast so much that it would look washed out. i dont mean anything special just tone down the black or dark lines in the tiles so they are more gray and feel more mellow thats all. I think the addition of boaty details like the seats helps too. It also seems a little too deep for its length, which is probibly inevatable given the square format, but you are able to extend it lengthwise by 2 pixels still, which might help that a bit; worth a look anyways. Well it was just a quick edit of the minecart as a base, and I never got around to fixing it up since I didn't like it. However I will say those planks inside are great and I don't think I'd have though of it! Thanks!